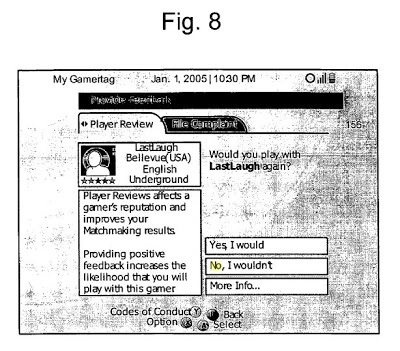 The ‘970 patent describes the Xbox Live system for matching up users during online play. A number of factors are used to match up similar players to make the game more enjoyable for all players. Factors considered are recent games played and other user’s feedback on a particular player (positive or negative). A player who receives positive reviews from recent opponents will be matched up with users who also receive positive reviews. This allows a user to play against opponents who are most likely to stay in the game, follow the rules of the game, and contribute positively to the overall gaming experience. A matchmaking service that selects matches based on personal/social characteristics as well as skill and experience. The service takes into account direct feedback from other players about positive and negative experiences with a particular player and expectations about appropriate conduct and type of game being played before a player joins the game session. 1. A system for socially matching game players for playing a multi-player computer-based game, comprising: a database, stored in a computer readable medium, having a plurality of user profiles, said user profile comprising a plurality of attributes of a plurality of users; and a service, operating on a communications network, receiving input from a select one of said plurality of users from an input device providing criteria for selecting users from said database wherein said criteria include level or social type of play desired by said select one of said plurality of users and wherein said service matches others of said plurality of users indicating a disposition to play at the selected level or social type of play and wherein said service ranks the others of said plurality of users at least based on recent game play in which the select one of said plurality of users provided positive feedback.